OK. So I've been at this Master's degree thing for the majority of the time I've been with my current employer. It took me three+ years to find the program that would take me (the Online MBI Program at Oregon Health & Science University), and almost three more, but I'm FINALLY FINISHED! And the funny thing was, that I finished in the first place I first looked some six or more years ago. But quite frankly, I enjoyed every single one, and aced them all (save one, in which I only got an A, and it wasn't in any of the ones above). I'm about 2/100ths of a point from perfect, which quite honestly does NOT reflect my own perception of my ability at all. I think the biggest thing that I learned over the last three years was the dramatic gulf that still existing between the "practical", technical, software engineering disciplines, and the academic, but also highly intuitive medical disciplines. The latter are both more and less science than the former, or perhaps I have that reversed. At the population level, the math and science in healthcare is all there. Across the software engineering disciplines, not so much. In the aggregate, software is still high art. And yet at finer grains, healthcare is so much more art than the day-to-day of writing code and implementing algorithms, which is almost all logic (math). One of the things that I have very clearly decided is that I will focus much more attention on teaching in the future. I've always loved teaching. The most enriching experiences I had was being a TA for the Standards and Interoperability class. In most of the teaching I do, I see students for a day or two. I never really get to know them or see them grow over the course of a term. Even though my time teaching was very short, working with others over a period of seven weeks, the last of which covered almost a week together in the same space, was truly different. I got to see people learn and grow and even change the way that they think in ways I would not have expected, and yet pleasing none-the-less. Again, I have to profusely thank my advisor, Dr. William Hersh. Without his support I would never have entered the program, let alone finished it. I have to say he made it interesting for me in many ways I didn't expect, one of which I hope you'll be seeing in a journal sometime in the next year. Today, I sign off differently, tomorrow I'll be back to the same-old, same-old. P.S. In a couple of weeks I'll be able to share the content of my capstone report with you. Hopefully I'll be able to put all that writing energy that's been going elsewhere for the last three years back into this blog. I'm more than six months into my new position, and there have been a lot of changes over the past few months. I dropped my eldest daughter off at college last week. I still haven't adjusted to that. I found myself wondering at 4:00 today why she wasn't home from school yet. Oh yeah, I reminded myself. November for Thanksgiving. Next week I finish my last class in my Masters in Bioinformatics. That and turning in my final capstone paper are all that stands between me an my degree. I've learned a lot over the last three years in that program, and I cannot recommend it highly enough. Bill Hersh has put together a great program at OHSU. Whether you go for the certificate, the masters, or even just the 10x10 program, it's all good stuff. My standards work is slacking off as my implementation work is picking up. I'm principle architect for three teams working on Interoperability stuff. I wear three hats. Some days I'm an architect, others a product manager, and others, an engineering manager. Some days I do all three, sometimes at the same time. My schedule is split between three time zones, the usual left-coast right-coast for the US that has been the norm for most of my life, but now also about 4 hours in the middle of the night (12am -4am) Bengaluru time. I sleep when I'm tired, which is not as you would expect to be "most of the time". I still struggle with what I want to be when I grow up, forgetting that since I managed to reach 50 without doing so a couple of years back, I don't actually have to grow up, and I have a certificate from my family to prove it. I suppose that some day when I retire, I will want to teach full time, rather than spending about a third to half of my time doing that. What I think that really means is that my projects will become my students, rather than having students because of my projects. Now if I could just figure out how to get the next six things done that I need to before the day is over, without moving to somewhere like Mars, or worse yet, Mercury or Venus. In case you missed me, I've just gotten back from a fifteen-day long trip, where I spent the last eleven days of it in India. While there I conducted three training sessions on FHIR, one internally at GE offices in Whitefield, Bangalore, one for HL7 India, and a final one for a partner organization in Mumbai. While in India I gave an overview of FHIR to nearly 200 software developers working in Healthcare. There's a great desire to learn more about FHIR in India, and I was privileged to be there to spark the fires as it were. 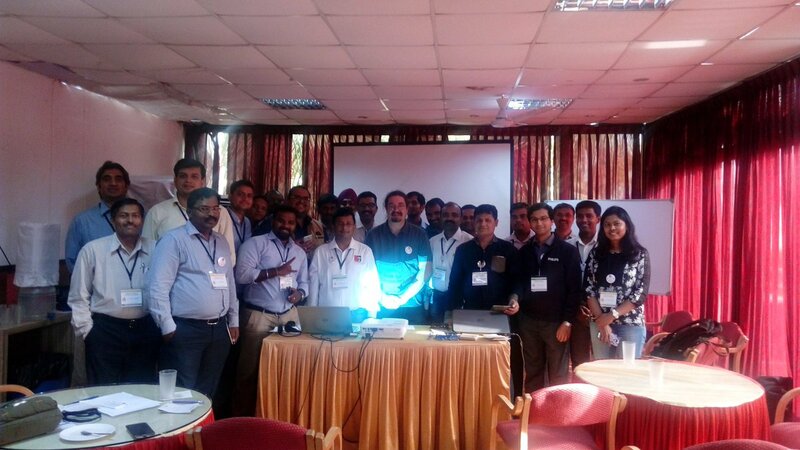 I am grateful to HL7 India who was able to pull together a half-day plus session in Bangalore on short notice. I expect we'll be doing more together to follow up, as I expect I'll be back later to conduct some advanced sessions. I'm also trying to get a FHIR Connectathon started in India as well, more on that later as plans come together.